"Tyler Motor Court - Orlando, Florida - C. 1940." 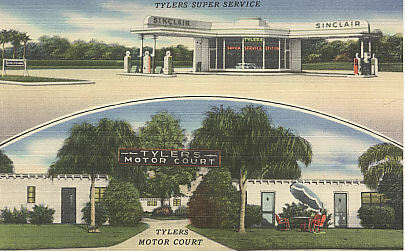 (1842) POSTCARD: Tyler Motor Court - Orlando, Florida - C. 1940. -Condition: Very Good. - Has Not been Posted. Picture of Motor Court on the front with a picture of a gass station. It was located on South Orange Blossom Trail. Price: $4.00 + shipping.